Matt Doherty previously suggested his face didn't fit in the Ireland set-up. 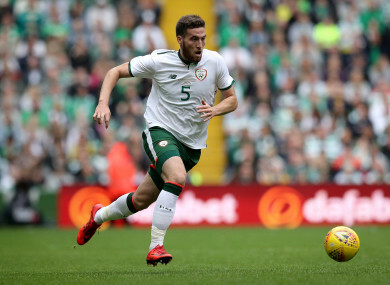 IRELAND BOSS MARTIN O’Neill has defended his decision to limit the game time of in-form Wolves star Matt Doherty. Doherty has arguably been the standout Irish player of the season so far, and was yesterday named Premier League PFA Fans’ Player of the Month for September. Many observers had expected the wing-back to start in Ireland’s recent clash with Poland — particularly with first-choice right-back Seamus Coleman out injured — but Fulham’s Cyrus Christie was preferred in the role, with the Dubliner having to make do with a second-half appearance off the bench. However, O’Neill insists the player remains firmly in his thoughts, rejecting claims that his face “doesn’t fit”. The Ireland boss instead pointed to the good form of Seamus Coleman and Cyrus Christie as the primary reason for Doherty’s absence from the team more often than not. “I went to see him Saturday,” O’Neill said. “The team didn’t play particularly well in the first half, but he was strong through the second half in particular and he scored a goal as well, so he’s having a really good time at the moment — he’s one player who’s playing regularly well in the Premier League. He’s got a good chance of being involved [in the upcoming games]. “I think he did that [interview] with a reporter who also did it as well the previous year. Matt’s been in the squad here now and he has a natural difficulty obviously since breaking into the [squad] here, because he’s essentially a wing-back at the moment — that’s the position he’s most comfortable in. Speaking more broadly about his selection criteria, O’Neill said both club and international form come into the equation. He added: “If you took young Aiden O’Brien, who played in the game against Poland, did well, worked exceptionally hard in the game, got a goal for his rewards — which was great — and comes back to find himself sometimes starting, sometimes coming off, sometimes on the bench in the last couple of weeks as well for Millwall, [it is] a wee bit frustrating. “But if he comes into the squad, I think he should not concern himself too much with what’s happened in the last couple of weeks at club level and try to concentrate and try to think about the good things he did in the game in Poland. O’Brien is far from the only Irish striker who has not been an automatic starter at club level in recent times. Shane Long has been in and out of the Southampton team over the past couple of months, and O’Neill admits this situation is far from ideal. In truth, we don’t have anyone who has proved themselves to be a prolific scorer, so it is a difficult one. “Shane is not that — he hasn’t scored at club level now for quite some considerable time, and of course, that plays with your mind. “But you have to be very, very strong and think then the next chance that comes along, ‘This is the one that I’m going to take’. Another Irish striker who has had a frustrating start to the season is Sean Maguire. The Preston attacker picked up a hamstring injury in pre-season, but returned to action at the weekend off the bench and subsequently produced an assist to help secure a much-needed 4-0 win over Wigan. With the player lacking game time, O’Neill hinted he was likely to be used off the bench if at all. “He just got into the squad, he trained for the last few weeks he was telling me, which is good, and obviously he’s had a few historical hamstring problems that have arisen in the last 14-16 months and when you start getting those, you have to make sure that you’re absolutely fine. “But we’ll look after him and we’ll monitor his training this week and monitor everything he does, which we’ll send back to Preston so that they know that we’re treating the player in the manner in which we’d like to be treated ourselves. So we’ll see how he is. Email “'I never thought for one minute that his face didn't fit' - O'Neill denies Doherty claims”. Feedback on “'I never thought for one minute that his face didn't fit' - O'Neill denies Doherty claims”.